Blair Home freshens up your home decor with contemporary housewares for every room of your home featuring unique housewares for the kitchen, bedding and all of the home basics. 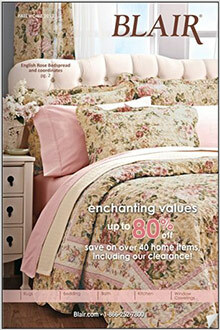 Enter the promotional code - CATALOGS15 - during checkout on the Blair Home website. Home basics - Blair Home covers your home basics from A to Z. Furnish and decorate your home with contemporary housewares for your kitchen, bedroom, bathroom, patio or garden. You'll find home accents that add a warm touch to any living or family room with attractive area rugs, lamps and eye-catching throw pillows. Blair Home even has a selection of unique housewares for your pet with pet throws, beds and more home basics they'll want to bark home about! Contemporary housewares - Incorporate some contemporary flair into your interior with contemporary housewares that look great while making a modern statement. Decorate your space with contemporary bedding fashions, bath linens, contemporary rugs and draperies for an instant upgrade, or personalize your home's exterior with contemporary patio and garden home basics from eco-friendly doormats to planters and solar outdoor lighting! Bedding basics - Explore the basics of bedding all in one place with Blair Home's collection of contemporary bedding fashions! You'll enjoy dressing up your bedrooms with fashionable bedspreads and coordinates, cozy comforters, charming quilts, complete bedding sets and more bedding home basics including sheets, blankets, pillows, pads, covers and more bedding accents from precious pillow shams to bed skirts! Kitchen basics - Every well functioning kitchen needs to be stocked with the right kitchen basics. Find all of the right home basics for the most popular room in the house with a well serving selection of cookware and bake ware, small appliances from toaster ovens to slow cookers, mixers, blenders, coffeemakers, food processors and everything else you need to keep your kitchen running smoothly. At Blair Home, you'll also find accents to improve your kitchen decor with kitchen curtains, tableware, rugs and more! You'll feel at home when you shop the Blair Home catalog for all of your everyday home decor essentials. Whether you're shopping for unique housewares for your pet, popular As Seen on TV Products, or home basics including rugs, window treatments and lighting, Blair Home improves your every day living with high quality products from their home to yours.